I was very impressed with Sound Awakener's Hidden when I reviewed it awhile ago. Nhung Nguyen has a real knack for using moody strings and harsher sound samples to create compositions that hang in the air like some strange and dark insect swarm, hypnotising and edgy. I was very pleased when Nhung Nguyen asked me to review another of her albums, September Traveler. 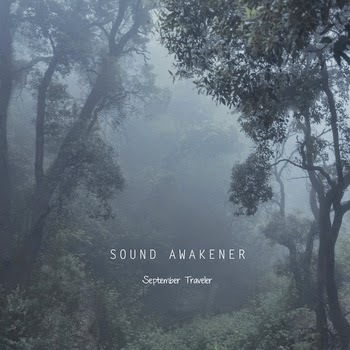 September Traveler is a collection of Sound Awakener’s early works in 2011 and 2012 (except "The call is fading"). It is also the soundtrack for Irene Cruz’s exhibition What dreams are made of, which took place in Berlin from 6th to 18th February, 2015. The title September Traveler refers to the journey through moments, total darkness and lost, blurred light. The atmosphere of the music is cold, soft and a little bit dreamy, mostly created by drone elements and field recordings. All sales from this album go directly to support Sound Awakener's recording equipment need. Your purchase is gladly appreciated! What sounds like string-based distortion mingles with a high-pitched tone that puts me in mind of fairground music slowed down and played backwards. It sounds like the soundtrack to some strange dream, but a dream that starts darkly and becomes a little lighter and more hopeful towards the end. Looping strains of piano dance and compete with a looming drone in the background. A muted thudding begins in the distance and pulsates below everything as the piano fades and comes back. The result is a track that grows in pace and feels stifling, as if it’s closing around you. Chirpy tones tinkle in a light soundscape that feels cold but not hostile in any way. Maybe a morning frost glinting in weak sunlight. Something dark does feel like it is coming closer as the track goes on however. Muffled voices and distorting electro-sound moves from ear to ear. Harsher piano and string notes add an element of discord as the background sound begins to take on the guise of an angry bee. It rattles and hums as reversed and slowed piano pierces the soundscape, giving movement to the shade mentioned in the track title. The track becomes deeper as it continues, higher pitched sounds echoing back from unseen walls as the other notes mingle in the increasingly harsh medley. Space emerges; strings twang, piano keys sound and thumps punctuate the void left behind. Stark piano and a swelling and dwindling background sound create a feeling of absence and loss, the notes swallowed by the airy space they float inside. The track ends very abruptly which was a surprise but very effective rather than petering out. September Traveler has a less chaotic sound than Hidden but one that is no less interesting. Piano is used to great effect, as you would imagine with Nhung Nguyen being a classically trained pianist. I also like her use of strings though, especially the deep and brooding distorted ones she laces her tracks with. All in all, September Traveler is a fine album that deserves a place in any dark ambient aficionado’s music collection and I happily rate it 4/5. Visit the September Traveler Bandcamp page here for more information.